Sail Area : 991 sq. 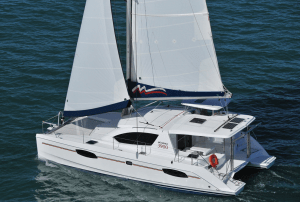 ft.
A luxurious new catamaran model, The Moorings 3900 was built by Robertson & Caine, and based upon the award-winning hull design, interior accommodation plan and helm station of their private model Leopard 38, named Cruising World’s Boat of the Year 2010 and Best Boat 2010 by SAIL. 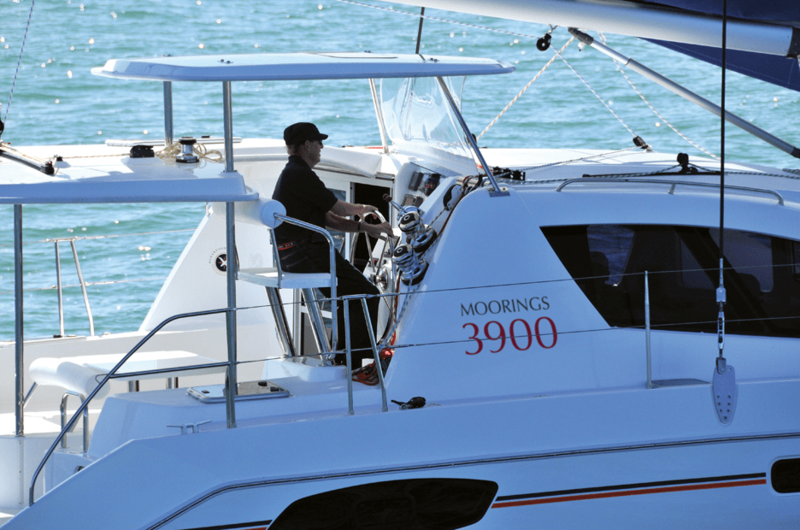 With her generous sail plan and hull design, the Moorings 3900 offers high performance yet is highly practical and easy-to-use. 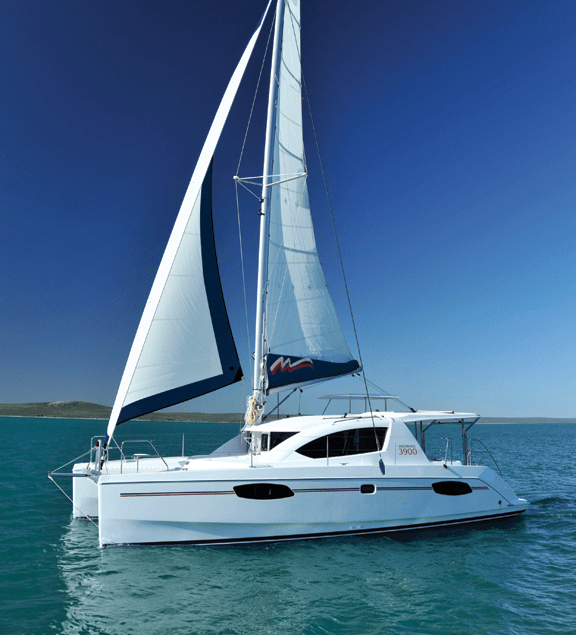 Uniting the very best features for relaxation and superb sailing, she features a raised helm station that provides 360-degree visibility beneath a hardtop bimini, while a separate extended hardtop with hatch ventilation shades the spacious cockpit area. Environmental considerations were also central to the design, with solar panels installed the hardtop to charge the onboard batteries. 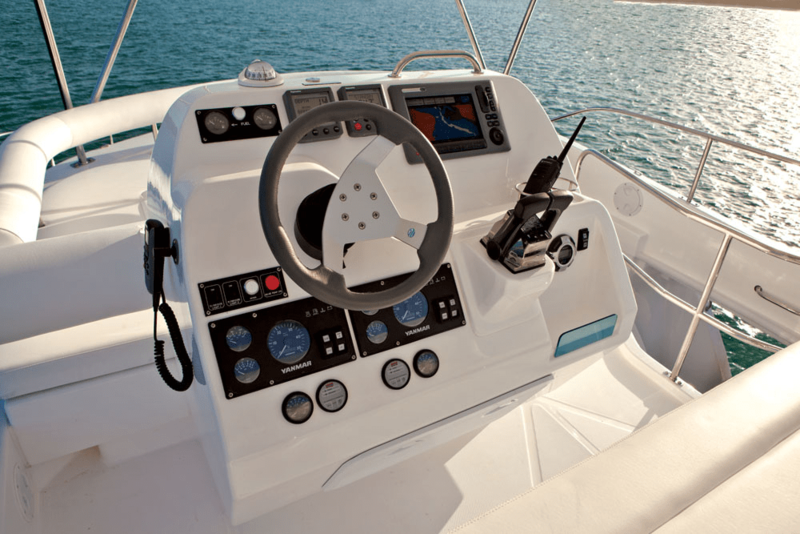 The Moorings 3900 is also equipped with a full suite of Raymarine navigational electronics, cockpit-led sail controls, anchoring system with electric windlass, convenient dinghy davit with electric winch, twin 30hp diesel engines and generator (shore-power A/C only in the Med). 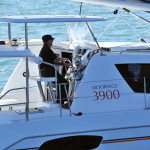 A wide stepped transom enables easier boarding. 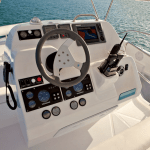 Vertical front windscreens offer panoramic visibility, lots of natural light, and sun protection. 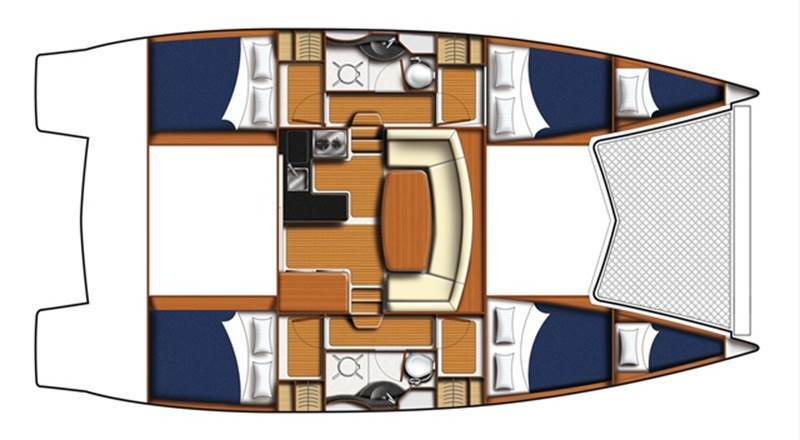 Below deck, comfort remains the top priority with a galley-up design and air-conditioning throughout the roomy saloon and 3-cabin/2-head accommodation plan. 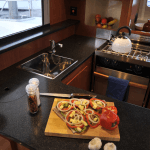 Fully equipped, the ergonomic galley layout features heat-resistant Corian countertops, standard stainless steel stove with oven and broiler, deep sink with mixer tap and ample counter and cabinet space. 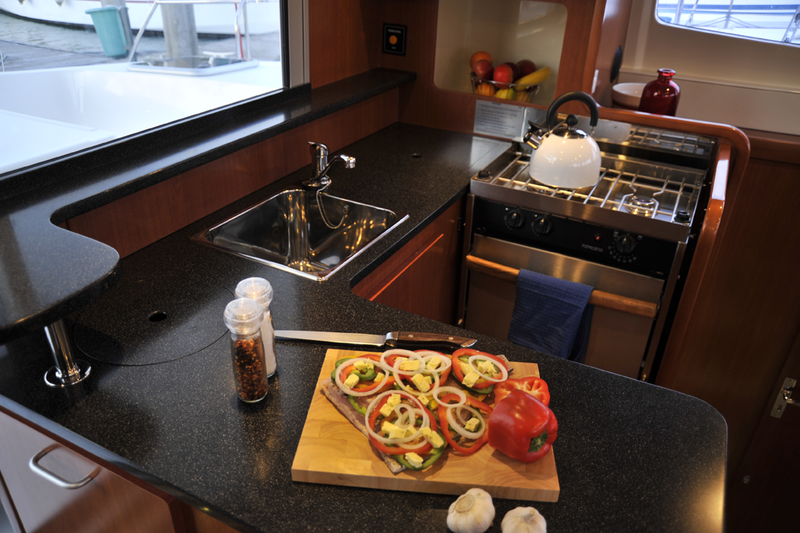 Storing provisioning is easy in the large refrigerator-freezer system’s well-insulated drawer opening compartments. 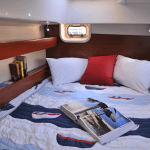 The entire starboard hull is dedicated to a well-appointed charter suite with queen-size berth, study area, hanging storage, and en-suite bath with electric head and enclosed shower compartment. 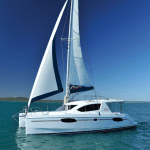 Two large double cabins with a shared bath fill the port hull. 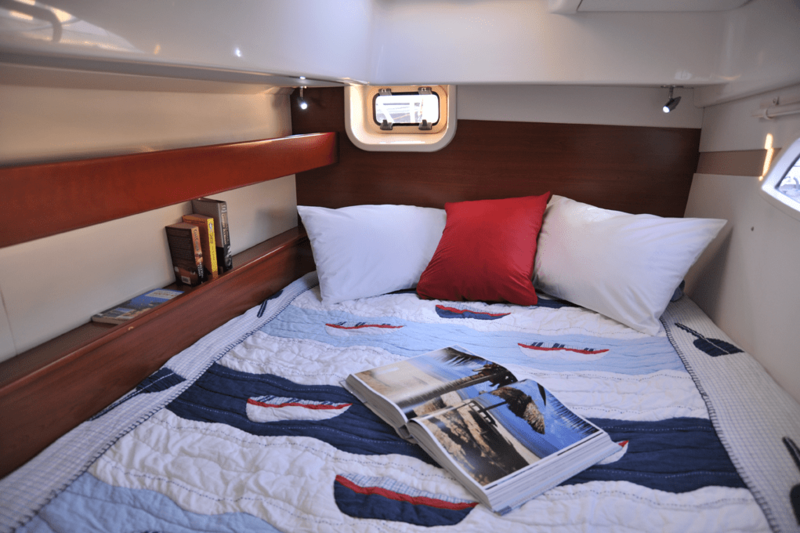 A small child berth / storage space is in the portside forward cabin. 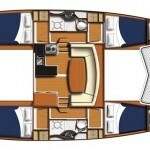 There is generous headroom throughout and substantial storage capacity provided by under-bunk lockers.